American Girl Unveils BeForever™ Line and Connects a New Generation of Girls to Timeless Stories, Inspiring Characters, and Endless Possibilities! | Mattel Inc.
American Girl Unveils BeForever™ Line and Connects a New Generation of Girls to Timeless Stories, Inspiring Characters, and Endless Possibilities! MIDDLETON, Wis.--(BUSINESS WIRE)-- On August 28, 2014, girls across the country are invited to step into the world of BeForever, American Girl's line of historical dolls, books, and related accessories that connects girls ages 8 and up with inspiring characters and timeless stories from America's past. First introduced in 1986 but now with a fresh new look, BeForever gives girls today the opportunity to explore the past, find their place in the present, and think about the possibilities the future can bring. From a daring Nez Perce girl who does her best to be a friend to the earth in 1764 to an optimistic girl who stands up for what's right in the mid-1970s, the adventurous BeForever characters help girls see the common threads—the shared interests, challenges, and dreams—that tie girls from all times together. The BeForever line will debut with eight characters; all-new, historically accurate outfits and accessories for dolls; new and refreshed fiction books; and an original line of historically inspired clothing for girls. To celebrate the launch of BeForever, American Girl is welcoming back popular favorite Samantha Parkington to its lineup of historical characters. Samantha was one of the company's original characters introduced in 1986, and her compelling story of compassion and friendship has inspired millions of girls. Archived in 2008, Samantha will be reintroduced with new products, including an ice cream parlor, a bike, a bedroom set, and several new outfits and accessories. Girls who enjoy adventure and contemporary fiction will be eager to read the new BeForever "Journey" book series, which will further bring each character's historical era alive for young readers. In each BeForever Journey, the story is narrated by a girl from today who travels back in time to meet a BeForever character and share experiences with her. The multiple-ending adventure allows the reader to choose what happens at key points, becoming part of the action herself. In addition to the new Journey books, each character's classic six-book series has been reformatted into two novel-length volumes, with the familiar stories that girls love. The BeForever line will also include brand-new contemporary fashions inspired by the historical characters. Available in sizes 6 to 16, each outfit combines design elements reflecting each character's signature look and time period with a modern style that is relevant for girls today. Girls will love the easy-to-wear pieces―from cute dresses to fun separates such as skirts, tees, and leggings―that perfectly blend history and fashion. To help debut the new clothing line, American Girl is partnering with Lifetime's Emmy®-nominated "Project Runway" for a BeForever-inspired designer challenge that will air on September 18th at 9p.m.EST/8p.m. CST. And, to extend the Project Runway experience for fans, a selection of the actual designs created for the BeForever-themed episode will be showcased at American Girl retail stores nationwide this fall. Girls will also be able to discover more about BeForever at American Girl retail stores through free and paid launch events, which will include giveaways, crafts, and in-store activities. And at americangirl.com/BeForever, girls can interact with the world of BeForever with online games, videos, and discoveries about each character. For parents and teachers, free downloadable Learning Guides that explore themes and issues from the BeForever stories are available at americangirl.com. The BeForever collection will be available on August 28, 2014 through American Girl's catalogue, at americangirl.com, and at all American Girl retail locations. BeForever books can also be purchased through retail and online booksellers. To learn more about BeForever, go to americangirl.com or American Girl's Facebook page at facebook.com/americangirl. 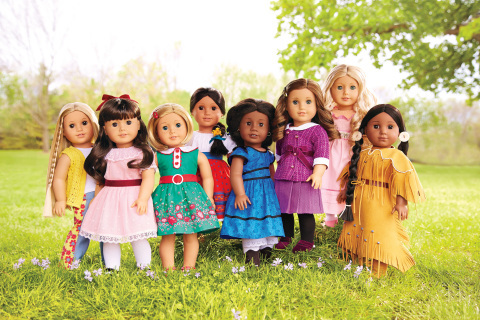 To request a free American Girl catalogue, call 1-800-845-0005. American Girl is a premium brand for girls and a wholly owned subsidiary of Mattel, Inc. (NASDAQ:MAT)(www.mattel.com), the world's leading toy company. Since its inception in 1986, American Girl has been devoted to celebrating girls ages 3 to 12 through age-appropriate, high-quality dolls and accessories, books, clothes, movies, and unforgettable experiences. Best-selling lines include My American Girl®, Girl of the Year®, Bitty Baby®, and its classic historical characters. Headquartered in Middleton, WI, the company sells products exclusively through its award-winning catalogue, on americangirl.com, and in its experiential retail stores. By inspiring girls to be their best, American Girl has earned the loyalty of millions of girls and the praise and trust of parents and educators. To learn more about American Girl or request a free catalogue, call 1-800-845-0005 or visit www.americangirl.com, www.facebook.com/americangirl, or www.twitter.com/american_girl.